Emily’s first job was driving a Red Bull car with a can on the back and from here she fell in love with the world of marketing and decided to finish her Sports Science degree and add a Masters in Marketing and Management. Upon completion, she held a range of roles at Red Bull culminating in leading the launch of Red Bull Cola. Red Bull had enjoyed phenomenal success, but this was an all-together different battleground, competing with the world’s most well known brand. In 2010 Emily left Red Bull and decided that after a decade in working in fizzy, sugary drinks, she needed to broaden her experience out of FMCG. She jumped agency side to understand how to market cars, mobile phones and chocolate. The next place she’d call home was Fallon, a small but globally renowned creative advertising agency, responsible for some of the biggest campaigns of the decade including, Sony Balls, Sony Paint and the Cadburys Gorilla. 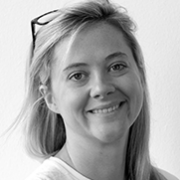 Here Emily worked as an Account Director for Orange, The Tate and Eurostar. Emily’s history with youth, her appetite for cool brands and her experience both agency and client side prepared her well for her new and current at Beats by Dr Dre. As employee number one she had to build the team from the ground up, while simultaneously getting to grips with the complexities of the business and the shifting reality of the industry. As the UK country lead for Beats by Dr Dre, Emily works in the European Marketing team at Apple HQ in London. Emily’s responsibilities are truly through-the-line managing everything that touches the consumer from events, to media. Her challenge is to take an all-American brand and translate it for a British consumer whilst still retaining its strong heritage.